Basic Rights: To speak and hear the truth. Positive qualities include (but aren’t limited to): Truth, articulating, knowledge, authenticity, inspiring, teaching, embodiment of Gods will. Shadow qualities include (but aren’t limited to): Lethargy, shyness, voice problems, insecurity, fear of other peoples opinions and judgements, thyroid & neck problems. Yoga Exercises to Balance this Chakra: All chanting. Wahe Guru Kriya, neck lock, neck rolls, camel pose, bow pose, cobra, shoulder stand. Issues Dealt With Here: Communication, creativity, listening, resonance, finding one’s own voice. Helpful Crystals: Angelite, aqua aura, blue lace agate, blue topaz, celestite, chrysocolia, larimar, turquoise, sodalite, aquamarine. 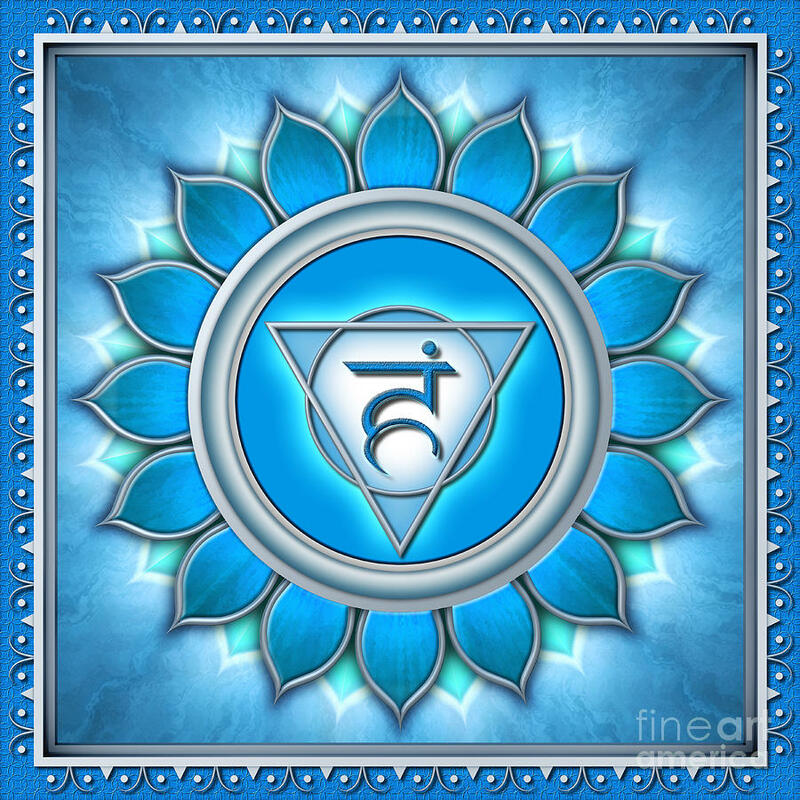 The throat chakra is the realm of the teacher. It is the place where the Divine speaks through the human body. It is where we begin to enter the mysterious realms beyond physicality. This is also where manifestation begins – bringing something from beyond through the emotions of feeling, the fire to do, the water to bring passion and earth to actually bring into physicality a creation. This chakra contains the power of the Word, the ultimate seed. This power is called vaak siddhi. Vaak Siddhi is the power to initiate the manifestation of a physical form or action by speaking the words that seed that manifestation. It is the power to plant seeds that will fulfill someone’s ultimate goal and destiny. This is the ability to have your tongue be the same as God’s tongue. In class the shadow aspect of this chakra was said to be control. We seek control because we don’t trust God’s will, therefore we fear Gods will. If we can get rid of our fear of God’s will we can live God’s will. The magnitude of this chakra has hit me as I write this blog post! When I was younger, I was chronically shy. I barely spoke to strangers, much preferring to live in my world of books that I voraciously read one after another. When I was in my later teen years I decided that I had to learn how to speak to people. It wasn’t just using the words, it was more so making sure that I could be heard and create space to have my words received. When someone has a closed throat chakra, in my experience, they seem like a wallflower. Their presence is not noticed, and they are not often given the chance to speak in our fast-paced world of go, go, go. 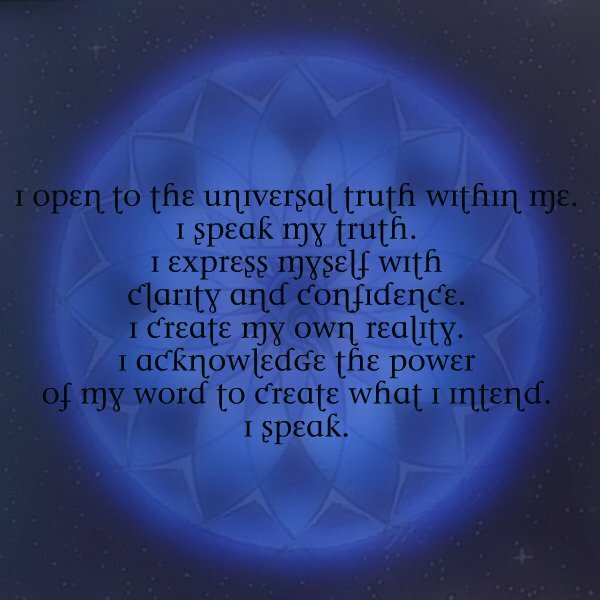 One of my first lessons in creating an open throat chakra was to gain presence. Sometimes I had to apologetically step on some vocal toes to be heard. Often I would raise my hand just like I was at school because for me that was easier. After I created the space and made my presence known I had to project my voice. It’s naturally soft and quiet; there are some men (like my grandfather) that no matter how loud I project my voice they will find it challenging to hear me. But I can be heard by the vast majority of the population despite having a soft, sweet and quiet voice. I had to learn to trust my voice. My voice knows what its doing. If I can trust my voice then it can do its job. Magically it knows how to project itself so others can hear. It will give me away authentically: cracking when something emotional for me is being spoken, skipping a word when I have a blockage around that topic, creating a sore throat when I’m not speaking from my truth. The next step for me was to do public speaking. I began to host my own events where I spoke about Reiki, which is part of what I do on my other job. I was teaching people in a 45 minute presentation about Reiki. I went up on stage before all who showed and did it by myself. I was shaking and trembling as I spoke, but after sometime of practising I found my sweet spot. This was the spot where I could trust that I knew enough about the topic that I could simply allow my words to flow, and as I did I relaxed more and more into the speech becoming more articulate. This is when I strongly could feel something beyond me flowing through me. And I learned to surrender and just let it flow. This was like when I was writing from inspiration but instead it was speaking from inspiration. I could listen to the words fall out of my mouth and learn just as much as you. That’s when I learned, for me, that speaking is one of the easiest ways for me to access the Akashic Records, tying with writing. I still have throat chakra stuff to work through – I’ve been contemplating my thyroid if it is healthy or not and sometimes I fear other peoples judgements (thought that has decreased over the years dramatically). I am also proud of where I’ve come to – some people would consider me an extrovert even! I’m definitely an introvert, but I take that a good sign that my throat chakra has opened significantly. The other thing about what makes the throat chakra so important is that is what you seed your future with. It is what you seed your manifestation with. The vibrational frequencies that exit your mouth times the force of will and emotion equals your manifestation. People who speak about what they want and query others about it generally get what they want. They allow their words to create the manifestation of the next steps they need to get what they want. It is through our words that we ask for what we want and that we make ourselves known to others. It is one of our most valuable assets because we can use our voice to correct anything perceived by another that is not our truth. It is our most powerful way to stand in our authenticity: to speak our truth. It is our strongest way to manifest: to speak our desires with will and emotion. It is our best way to be known: our voice in words and audio can be spread all over the Earth. Let’s open this baby up and let our Divine words of wisdom flow out! I am grateful to reach this article! I have strong throat chakra blockage since child and looking for the way to open it again. I wish to speak up but I am still struggling, I felt so much anger when I speak to someone and I am not sure how to heal it. I trust universe that my throat is going to be healed.